This past summer, I purchased a blue jacket at a consignment shop that was deemed a shopping mistake by many readers of this blog. I never actually wore this jacket out of my apartment, but I did put together a few outfits with it and snapped some photos. Not only did Bridgette give me a lot of advice on how to restyle the jacket, she also wrote a blog post around it. Bridgette didn’t really think the jacket was a dud; she just thought it needed to be styled differently than how I had done it. Below is a photo which shows my original ensemble, a failed attempt at creating a casual skirt outfit without the dreaded “church vibe.” While I may not look “churchy” in that look, I do appear more conservative (to use a nice term) than I’d like. Bridgette recommended making the jacket the star of the show and keeping everything else in the outfit very simple by comparison. Next to the image of the original outfit is one restyled look, and three more are shown in the following photo. I restyled my problematic blue jacket per Bridgette Raes’ advice. Here are three more new looks with the blue jacket. The new outfits are definitely a major improvement over what I started with. I think my favorite look is the one with the striped pencil skirt (but I wish the boots were shorter) and my least favorite is the one with the white t-shirt and jeans. I’m happier with the jacket restyled as per Bridgette’s recommendations, but I feel that it looks too short when paired with pants and too small overall. If the sleeves were a few inches longer, I would probably like it a lot more, but it’s still a bit too ruffly and feminine for my new style preferences. I enjoyed experimenting with some new looks incorporating the jacket, but I still plan to let it go. Perhaps I will find a better jacket in that beautiful color at some point and I can then revisit all of Bridgette’s suggestions. In this next before and after photo, all I changed were the shoes. I much prefer the revised look, which incorporates my new black caged sandals. Those edgier shoes help me to look less dressy and conservative. I swapped out the shoes with this blue dress outfit for a more casual and edgier look. I actually wore the new outfit to have lunch with Jill Chivers, who was visiting California from Australia last month! It was so wonderful to meet Jill and spend some time with her, and she was just as lovely and vivacious as I had imagined. Here’s a photo of the two of us together. Fortunately, it was an unseasonably warm day and I was able to wear a summer dress with sandals (you can’t see the sandals in the photo, but I was wearing the exact same outfit shown at right above). It was such a pleasure to get to spend time with Jill Chivers last month! I included the outfit below among the favorite looks that I sent to Bridgette prior to our second session. While Bridgette really liked the way the outfit looked as is, she also pictured the top half of the look with a black skirt and my blue sandals, which match the turquoise trim on the blouse almost perfectly. I like both the pants and skirt outfits with this black and white top. I liked the restyled version and plan to wear both outfits moving forward. I would like to find a shorter black skirt, though, as the ones I own are either midi or maxi length and cannot be shortened given the way they are cut. Hopefully when the spring clothing arrives in the stores, I’ll be able to find a shorter, slimmer black skirt that is to my liking. My black and red striped high-low skirt is one of my favorites and I especially like it paired with my black sequined tank. However, when I first wore that outfit, I had to wear metallic sandals, as I didn’t own a suitable pair of black sandals at the time. Bridgette thought the look would be better with black sandals and I totally agree. One small swap can make a big difference. I switched out the shoes in this ensemble and prefer the new look. While I was playing in my closet, I also tried the outfit with other shoes and two of my black jackets (the new mixed media draped front jacket and my moto jacket). I like all of the variations below, but the middle look is probably my favorite. The black booties look better with skirts than I thought they would, but I would definitely prefer if they were shorter, especially since my skirts are all knee-length (they look longer in the photos due to the camera angle, but this one in particular shows part of my knee-caps in the front). A few more new looks with the striped skirt. My black and white zigzag striped skirt is a definite favorite. However, I didn’t necessarily love it with the silver sandals and coral blazer shown at left below. Bridgette suggested pairing the skirt with a plain tank and different shoes and I like the new outfit much better. I also think it coordinates well with my newly acquired mixed media (knit with faux leather) drape front jacket. I liked wearing the outfit on the left, but I like the new version much better! I switched out the skirt from the ensemble at right above for my black and grey striped pencil skirt and liked that look, too. I think it’s a vast improvement over the outfit at left below with the purple ruffled tank and metallic sandals. I tried to do a casual skirt outfit, but the dressier version is more my style. However, the new outfit also looks quite a bit dressier. Although I’ve been trying to create casual skirt looks that I like, most of my attempts have fallen flat. I greatly prefer the dressier skirt outfits. Perhaps I will stick with dresses for my casual summer outfits, as I seem to have more success with those looks. I’ve done okay with casual maxi-skirt outfits, too, as full-length skirts actually look better with flat shoes, so those are also a good option for me. In terms of remaining casual, I think I fared better when switching out the flared denim skirt below for a less flared black skirt. With the different skirt silhouette, the green jacket no longer looks too long and the proportions are much better. Although I might prefer that the black skirt be shorter and narrower, I would definitely wear the restyled outfit as is. I no longer have the flared denim skirt, as I didn’t like the way it looked in its sole wearing (a different outfit than the one shown). I had settled in purchasing it, as I’ve been trying to find a denim skirt for a long time. I will hold out for more of a straight/pencil shape, which I will hopefully be able to find come springtime. The new skirt in this tonal green ensemble creates a more proportionate look. In some of the outfit photos I sent to Bridgette, I was wearing a two-toned grey moto jacket that I ended up returning (it was part acrylic and I found it itchy). I later bought a black moto jacket that has since become a closet favorite. Using Bridgette’s advice, I was able to create a much better look using the pinstriped skirt and my black moto jacket. The outfit on the right is more balanced with only one ultra-feminine piece. I also paired the black moto jacket with the polka dot skirt from the initial blue jacket outfit. I think the edginess of the moto jacket takes the look out of the “churchy” realm, particularly when combined with the caged black sandals. Although I could wear the restyled look to church, it doesn’t necessarily look like that’s where I’m going. This polka dot skirt looks less “churchy” on the right. Even though I didn’t have all of the proper pieces in order to implement Bridgette’s advice precisely, I feel that all of the restyled outfits represent a vast improvement over the original looks. The new ensembles are more in line with my style aesthetic and they look more modern and stylish. I have already worn a few of the revised outfits and felt quite happy while wearing them. The much-maligned blue jacket ended up being a “miss” after all, but I learned quite a bit from the restyling exercises using that piece. I enjoyed experimenting with new proportions, including wearing shorter toppers with pants. Below are a few outfits that I can see myself wearing which include shorter jacket or cardigans with pants. I will continue to experiment with this type of pairing, as I’ve wanted to get away from the long open cardigan silhouette which was a favorite of mine for the past few years. I’m going to start wearing short toppers with pants more often. As I’ve mentioned in the earlier posts in this series, Bridgette’s styling advice has helped me tremendously. I now have a much clearer sense of my style vision and how to interpret it through my outfits. My work with Bridgette has empowered me to better use what I have and to be more strategic about my purchases. Of course, my style journey is ongoing and I will continue to use Bridgette’s excellent advice as I put outfits together and shop for new wardrobe items. I say this is the last post in my Bridgette Raes series, but you never know. I may choose to do more outfit restylings (Bridgette gave me more advice than what I highlighted above) and I may opt to have additional sessions with Bridgette. For the moment, however, this is it. I hope you’ve enjoyed this series and have been able to learn through my experiences. It has been my pleasure to share Bridgette’s insights with all of you. Of course, you can continue to learn from Bridgette by subscribing to her excellent blog and following her on Facebook and Twitter. 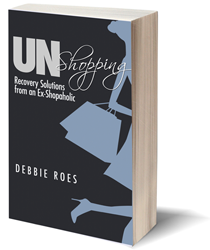 I’ll be back soon with the results of the “Recovering Shopaholic” reader survey. I also plan to showcase my best and worst purchases of the year before 2014 draws to a close. If you have any questions or comments regarding this post, feel free to share them. It’s always true that you don’t have to confine your comments to the topic of the current post, but since this can be a challenging time for overshoppers, I want to clarify that today. If you are struggling and need support, please ask for it. I feel blessed to have such a supportive community of readers and I love how you offer each other advice and moral support. If you post a question or concern, I know that you will receive a helpful reply (I usually respond, too, but others often beat me to it). About the blue ruffled jacket, you wrote, “I think my favorite look is the one with the striped pencil skirt (but I wish the boots were shorter) and my least favorite is the one with the white t-shirt and jeans.” I think the opposite — the white t-shirt and jeans outfit looks great. It’s the simplest one and it does make the jacket the ‘star’ of your outfit. I have enjoyed all of your posts — please keep posting! I agree. I think the striped skirt adds width and detracts from the jacket. I liked the other look better. I agree that the jeans/white tee is the best version of the blue jacket rescue. However, I still think this jacket has a decided “frump” factor that no amount of rejiggering can eliminate. This post is EXCELLENT! You and Bridget have clearly demonstrated how to make good clothes even better. Good work, both of you. I appreciate all of your feedback, beautystache, Brittany, and Dottie. I think I would like the jeans and white tee outfit much better with a different jacket. It’s hard for me to like any of those outfits all that much because I’m not a fan of the style of the jacket (for me) and how it looks on me. I’m glad you all liked this post. When I saw all of the changes together, I felt pretty good about the changes I’ve made. Debbie, this is (as always) a great post! I realized something about your outfits… You think of it as too churchy or conservative.. But I think it was too much ‘sweetness’. (I constantly have to fight that, myself). Just a little bit of ‘edge’ cuts through the treacle-sweetness, so you look ‘balanced’, more hip. I really love the direction you are headed in! Regarding your blue jacket outfit… I am thinking a black belt with a low contast buckle peeking out from the jacket would lengthen the jacket. I also think that you will find your booties are perfect, when you add dark hosiery or tights. I think your fair skin gives a lot of contrast to the booties. Try some black tights. I have found nice ones at Ann Taylor, but the best value, by far, has been a pair of Wolford Velvet 66 denier black tights. I hand wash them, or put them in a lingerie bag and use the hand wash cycle on a front-load washer, and I have worn them probably 100 times now, since 2010. The crotch seam is just now showing some thinning of fabric, but the rest of the tights look perfect. I love that red striped skirt, and how you styled it! You look great! Haha, I AM an airhead! When I scrolled down on my iPad the first time I read through the article, it scrolled down fast, and I completely missed the paragraph about sweetness and edge. Durrrrr… You already said it, I didn’t need to parrot it… Sorry! Interesting observation! I was wondering why I disliked to beige/bronze sandals so much, and I have to agree that they (and some other older combinations of clothes”) add “lightness” and “femininity” or, as MaryBeth says, “sweetness.” This blog is an EXCELLENT tutorial on how switching out a few key pieces can revive an outfit – nay, a wardrobe. Debbie, I hate nylon tights that feel like plastic bags over my legs. I love the cotton tights from Garnet Hill. They look nice enough to wear with formal dresses and are very comfy. I think you’re right on about the “sweetness” factor, Mary Beth. And actually I used the word “feminine,” but I like your word better. I think I used to be more “sweet” in my style, but I really don’t like that anymore. I am definitely going to try wearing tights and I appreciate the recommendations from Mary Beth and Nutrivore. I think I will like the booties better with tights because of the lower contrast (yes, my legs are about as white as they come!). Dottie, thank you for your kind words about my blog and this post. Back when I was buying so many new things all the time, I had it all wrong. I didn’t realize that I only needed to buy a few strategic items in order to switch things up. Now that I finally get it, I think I will naturally buy less moving forward. I will still have to watch out for my shopaholic tendencies, but the proof is really in the pudding, as my mother would say. Ironically, once you get a wardrobe that works (interchangeable pieces, lots of coordination, no “blue ruffled jackets” or other pieces that just don’t jive, you will shop less and less. And even if you do feel the need to shop (relieve stress, etc.) you will most likely not be drawn to buy clothes you know aren’t “Debbie enough.” Less (fewer clothes) really is more (options, coordination, quality of life, etc.). Also, shopping is more rewarding. Everything works, there are fewer returns (at least fewer for not going with anything), and time is well invested. Randomly buying a lot of stuff doesn’t seem to work for me. I can see all of this now, Dottie. I even noticed it when I shopped with my shopaholic friend recently. She bought quite a bit more than I did and seemed to buy a lot of virtual repeats of what she already has. I was much more deliberate and discerning. It’s taken me a while, but I’m finally on a better track with shopping and my wardrobe. I loved the new looks with the blue jacket… it’s a pity you chucked it. It was really interesting to see your “before” and “after” stylings, and I will be keeping Brigitte’s advice to you in mind as I’m revamping my wardrobe. Thanks, Lawyerdoll. I definitely want to find a short blue jacket, but that particular one wasn’t right for me. The sleeves were just too short and I wasn’t a fan of the more ruffly look. I’m glad you were able to glean some advice that you can use from my posts. Bridgette definitely has a lot of wonderful wisdom to share! I can’t say how much that draped front mixed media jacket improves every single outfit you put it with! Great addition. Goes to show, just one or two modernized updates can really, really make a huge difference. I’m heading to bed so not a lot more to add, but just had to get that out there. Fabulous! Thanks, Mo. You are so right about the power of just a few minor updates. I didn’t get it before, but seeing all of these photos together really helped to drive the point home. I know that jacket will be on my best purchases of the year list that I will publish soon! Re your search for a denim skirt – you may want to try GAP, where my daughter buys short, straight, front zip fastening denim or corduroy skirts (depending on the season). Re your Brigitte Rae postings – I agree with the poster above about the white Tee, jeans and jacket being the best look for you. My own thought is that you seem to suit contrasts of darker colours such as black, white and jewel shades and sharp shapes with no frills! Thanks for the skirt tip, Roz. I will periodically check out what Gap has to offer and maybe I’ll luck out. I agree about the colors and shapes that suit me best. I think I will restyle the white tee and jeans outfit with another short jacket and I bet I will like that look. I hope to find a better short blue jacket, as I think all of the restylings have possibility with a better jacket option for my shape and style. Season greetings to you, too! I hope to make it back to the UK sometime soon, as I love it there. Looking good! I’m not sad the blue jacket went, you made a vast improvement with the new styling of it but it was just too twee for your emerging ‘dramatic’ style. Love you in trousers, agree that black opaque tights would help the boots. I agree about the jacket being too “twee,” Saltbox. That is actually the perfect word for it. Twee was the old me, but not so much anymore. I’m going to pick up some black opaque tights to wear with the boots. I wouldn’t have thought those boots (which I have only worn with pants thus far) would work with skirts/dresses, but I think they will with the tights instead of my white legs. Debbie, this post was so exciting to read through! I am so IMPRESSED with how edgy and cool your new and improved outfits are! I think my absolute favorite piece is that mixed media jacket…it looks FABULOUS on you and really compliments your coloring and shape. Also loving how the caged sandals really emulate that style aesthetic you’ve been craving. I was checking out your archived outfit posts last night and I can’t even believe how much you’ve changed. I know you’re still feeling too dressy for your environment, but to me you look incredibly chic, put together, and confident. I am just so impressed. Also, I really love black on you…several of your improved outfits incorporated black instead of the kind of bland grays and such you were wearing before, and the contrast is striking and beautiful. I’m so so excited for you! I feel like Bridgette was able to really help you put together things that make you feel like YOU. I also agree with some other posters that you should just try a simple pair of black opaque tights with the booties…you can get pretty cheap pairs and just try them out and see if you like the way it looks. And also echoing sentiments of other commenters, you look fantastic in trousers/pants (I know this has been a hang up for you in the past) and I love how many of your outfits included them. 🙂 Great job, and I would personally love to see more outfit ideas in the future as you continue to play with this aesthetic! Thanks so much for your kind words, Ry. The mixed media jacket and the caged sandals are two of my very favorite purchases from this year. It really is amazing how much of a difference they make to my outfits. I love wearing black, too, and was very happy that Bridgette told me it looks good on me (although I’m sure I would still wear it even if she said otherwise, as I really like it, just maybe not as often). I cringe about some of the earlier outfit photos I posted, but it’s all part of the journey. I think I liked them more at the time, although some not so much, but I’ve moved on to something new that feels like a better fit for who I am. Bridgette helped me SO much in bringing it all together. I’m definitely going to try out the tights and I think I will probably like them. As for pants, I wear them often, but was happy to find some new ones that fit me better (although the trouser jeans are old). I’m even warming up to skinny jeans since I found some that are more comfortable to wear. I’m sure I will post more photos in the future as I continue to play with my style aesthetic. Hello Debbie! I’m not commenting much due to general busyness but I love reading your blog. I had to comment on this one though! You look really fantastic- like I can see YOU and then see a cute outfit secondly rather than the clothes wearing you. I love that mixed media jacket! My favorite outfits are the pants with the red top and black jacket, the blue tank with the jacket and both the striped pencil skirt and fuller zigzag skirt. I agree with you- that blue jacket is a great color but I see the jacket before I see you, even though you did improve upon it I think you made the right decision to let it go. It isn’t ‘Debbie’ enough! You look great it all of these though, remember that we as clothing addicts 😉 obsess more about this than the general public and when we analyze clothing and outfits, we see things most people do not! 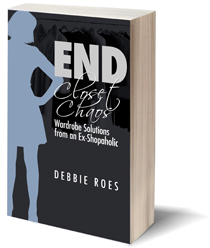 “It isn’t ‘Debbie’ enough.” A GREAT shopping mantra!! Good to see you commenting here, Meli. I’ve missed you and your blog, but I know you’ve been busy and struggled with being sick. I hope you are feeling better now. Thank you for all of your kind words. Your favorite outfits are ones I really like, too. Good comment about the jacket not being “Debbie enough.” That’s very true and now that I see it, I wonder why I bought it in the first place. I think I was dazzled by the color and the brand. I do still hope to find a jacket in that color, but this one wasn’t the right one. In the meantime, I will try the blue cardi and the black jackets in place of the blue jacket and see what I think. Thank you lady! I had 3 kidney infections recently and I have a long way to go when it comes to figuring out what is going on, etc. but I currently am healthy :). I just got so backed up between work, having been ill, and now the holidays! I hope to get back to blogging soon. I have yet to post my accountability post for last month, and I have a lot of year-end posts I want to do as well. I’m excited about next year and doing better! I remember you mentioning the kidney infections and I felt so bad for you! I’m glad that you’re healthy at the moment and I hope you can figure out what happened so you can prevent it from happening again. I was glad to see you post again today! I have a lot of year-end posts to do, too, but some of them will happen in January (just like I did at the beginning of this year). I’m excited about next year, too. We both improved a lot this year, but I’m sure we will continue to do so in 2015. I can really tell how you’ve incorporated Bridgette’s advice into your new outfits. They look great on you! My favorites are the last series of pants outfits with short toppers. All 3 are fab and edgy for your new style. I also love how those black cage sandals change the vibe of an outfit. How high is the heel on them and are they comfy? As Ry said above, I love you in black and jewel tone colors. You just shine in those colors. I love that last group of pants with shorter toppers too. You have a very long and graceful look. Thanks, Kim and Stephanie, for your nice compliments on my pants outfits. I’m going to start wearing pants with shorter toppers more often. I’m glad that I took the time to try other looks after I was less than thrilled with the blue jacket outfits. The black caged sandals are 1.5 to 2 inches high and are quite comfortable, but I haven’t worn them for any extended walking as of yet. Here is the link to more information about them (I got them on sale in early September, but they are still available online): http://www.footwearetc.com/ziera-shoes/_/ziera-ipswich-black-leather-womens/#sthash.IDf69Gd0.ubsN5QzF.dpbs I don’t post links all that often because so many of us get enough of that elsewhere, but I’m happy to share some of my better finds from time to time. You have definitely done a huge job in defining your style now, Debbie, and Bridgette’s suggestions are so interesting. I love all the after outfits :-). I noticed, that you always keep the blue jacket buttoned – what happens when you unbutton it? Thanks, Mette. I think I tried unbuttoning the jacket and it was fussy, but I will double-check. I usually don’t button my jackets, so there must have been a reason why I was buttoning this one. However, it’s been a little while since I took the photos, so I’m not totally sure. I would love to find a blue jacket in more of a moto or military style, as I think I might like that better. I think the simplifying of the outfits (fewer colors), use of the “dark column,” and most of all the caged sandals achieve the updating. Sometimes it’s hard to pinpoint the chic-ifying element, but I’ve also noticed a lot of caged sandals featured in outfit ads–on the Eileen Fisher site for instance. I think you’re right on, Frugalscholar. I like the dark column and feel the caged sandals have made a huge difference with my outfits. I’ve seen them in a lot of ads (and on bloggers), too, which is a big part of why I bought them. I liked the look, but the shoes I’ve seen were usually too high. I was thrilled to find a lower-heeled version that is actually comfortable on my fussy feet! Wow, wow! You look so great and comfortable in your own skin in all of these new outfits. And honestly, I think going easy on jewelry and accessories is both very “in” and also much more youthful. But that’s just my opinion…I’m curious what you and others think. Like several people above I thought the jeans and long tank were the best pairing for that blue jacket. That outfit gave you legs for days! Maybe you should try that look with one of your more on-trend moto jackets instead. I think the biggest transformation was with the polka dot skirt. The colors pop so much more in the second photo!! Thanks so much, Sara. I agree it would be a good idea to try the white top and jeans with a different outfit. I’m sure I would like it better, as the blue jacket was skewing things in my mind. Good point about the jewelry/accessories. I’m preferring fewer items these days and sometimes struggle with which earrings to wear with a necklace. I feel that I need to keep my earrings very simple when I wear a necklace, which is why I don’t wear my necklaces very often. I don’t want to buy much more jewelry because I still have a lot, but maybe one or two pairs of small, simple earrings would be a good way to go. Holy Hannah, Debbie, you have even floored me, and I’m the one who advised you on all of this! Looking through these changes, it is mind blowing, like I am picking up pieces of my brain off the floor right now! I don’t even know where to begin. First of all, I think you did an awesome job at implementing these changes while also showing that all it really takes are some minor tweaks to make a huge difference. I am so grateful to you for showing others this because it can be hard to communicate without images like yours. As I have said before, privacy restrictions that I have in place with my clients doesn’t allow for me to post things like this. Secondly, I not only think it is amazing that you have been so generous in letting everyone in to your transformation, but that you implemented it. When I work with clients in person I can see the change and have a much bigger hand in making sure it happens. But when I work with clients virtually they have no choice but to take on the changes I suggest on their own. I think it is incredibly awesome how you really listened and tried new things. Third, I think so much of this transformation has to do with the energy you are giving off. The biggest challenge we had was to capture who you are and what your style is in your clothing. As we agreed, much of your clothing was nice but it wasn’t you. As a stylist, when you see the essence of someone and attempt to help them express it in their clothing it can be a hard concept to communicate. What I love is that you totally got exactly what I saw for you, a much sleeker and modern style. I am totally okay with you ditching the blue jacket. It’s amazing how much attention that one jacket has gotten between your post and mine. However, I am so glad we had it to experiment with because it was a great piece to use to create other similar looks using a bold jacket that is more streamlined. But I do agree, that one was a little too ruffly for who you are. On your list should be a great separate jacket in a bold shade. Write it down! LOL. What should also be pointed out is how much information you received in such a short period of time. What did we have, 2 sessions? There are times when I think the advice I am giving is so simple that I wonder if it is really that helpful. However, from what you have learned, I am seeing that it is often the simplest of things that we miss. I hope that, through your post, more people will see how attainable looking good can be!!!! You have been a dear client, a wonderful friend and colleague and I am not only so happy for you but proud and extremely grateful to not only been part of this journey but to see it live like this! Thank you, my friend. Yes, we only had two sessions, so people can really see that a lot can be done in a short period of time and for not that large of an investment. The time and money spent is well worth it! Of course, I would STILL love to shop with you and will definitely make that happen when I am next in NYC (I haven’t been there since 2005, so another trip is in order!). About the blue jacket, your restyling suggestions got me experimenting, which led to other pants ensembles that I liked better. I am for sure going to look out for a blue jacket that is a better fit for my body and style. It’s on the list! You’re right that just a few small changes can make a really big difference. I have more changes I’d like to make, but it was good to see that I didn’t have to trash a lot of my clothes and go on a huge shopping spree in order to shift my style. More than anything else, I hope that’s what my posts have shown to readers, as I know that many of them struggle with overshopping, too. It really doesn’t take a whole lot at all! I appreciate all of your kind words, as well as the excellent help and advice you gave me! Deciding to hire you was one of the best decisions I made all year. Plus, working with you was fun, too! You’re even funnier than you are in your blog posts. I hope to get to hang out with you in person sometime, as I’m sure it would be a blast! Thanks again for everything! I think we need a burning ceremony for that jacket. Seriously. Come to NY and we’ll hang. Although I would much rather be in San Diego right now. Oh and I hope you gave Jill Chivers a big hug from me when you saw her. God, I love that wacky Aussie! Well, I did give her a big hug when I saw her and when we parted. One of those was for you 🙂 She is a lot of fun! Even cooler than hanging out with you would be hanging out with you AND Jill. I wonder if I could keep up with the two of you? Oh we’d make sure you would! Yes, that one was really key, Paula. I had an “aha moment” with that and implementing it has made a huge difference for me. No more “twee” outfits for me – yay! For years I’ve worn DKNY tights, which I purchase at Nordstrom. They hold up very well. I usually buy a new pair of black and brown every year. Thanks for the recommendation, Maddie. If the tights last a full year, they’re definitely a winner, I’d say. A solid opaque black tight is a great staple item, and keeps you warm in skirts if you are cold natured (I am)! I will second DKNY as great tights that last, and also nordstrom’s opaque tights are very nice and go on sale for about $10 I think? I got two pairs during their fall sale and have been very pleased. They aren’t too pinchy in the waist either. I have had mixed luck with Wolford tights. I love tights and have a bit of a collection that I keep because they don’t take up much room. I amassed SO many pairs at one point! I was definitely a less conscious shopaholic then and they are easy to overshop. I culled but still have a half drawer full of unusual tights I love. Patterned tights wear like an accessory and can add A LOT of edge to a look and bolder patterned tights tend to get comments. Or a subtle textured tight can add just a layer of interest that isn’t loud. Debbie: love tons of your new outfits! Balancing the “sweetness” in outfits with our favorite colors is one of the defining characteristics of style, I think. And sometimes you just have to go by feel! Thanks for the additional tights recommendations, Sophie! I can see how tights would make a big difference in the way outfits look, as well as helping to keep us warm. I appreciate your kind words about my outfits as well. Thanks, Debbie. Yes, it HAS been an exciting journey. I can see that the shorter jackets with pants lengthen my torso, which is a good thing since I’m all arms and legs! This is excellent Debbie. Love all of your posts in this series. You have made great gains this year, and your good writing, and thoughtful posts continue to inspire me. I appreciate your kind words, Terra. I’m glad you liked the series and I’m happy that you find my posts inspiring! Wow, this post is quite amazing! It’s impressive the major change one little switch can do. I really like how you restyled the infamous blue jacket, except for the first look you posted. I feel like there’s too many volume between the jacket and the flared skirt. I feel the same for the restyling of the floral blouse with turquoise trim : the shoes are perfect but the skirt feels too voluminous with the top (which has so many details). Globally, I feel like the “churchy”, dressy vibe comes from the shape and length of the skirts. The looks you posted with the black and gray or black and red striped skirts are waaay more edgy. I also feel like this church vibe comes from the metallic silver shoes. It adds a dressy thing to the outfits that’s contradictory with the edginess you want to add to your looks. Also it kinda makes the outfit unfinished (in my opinion) because the metallic silver doesn’t stand out from your skin. Those two observations really stroke me when I was admiring and comparing the before/after outfits. I don’t know if my opinion is really valid as I’m not a style expert but if it can help, I’d be happy! Once again, it’s really great to see you improving your style and I really hope you’ll continue that way! Actually, Cedquique, I totally agree with you about the blue jacket and the skirt. The skirt needs to be slimmer and more streamlined for that type of a jacket, but it is still a vast improvement. Funny how this jacket will never truly die and manages to be an ongoing topic! Haha. But, yea, I think you are spot on. And you are also right about why the skirts look “churchy”. Debbie and I have spoken at great lengths about these skirt shapes and exactly what you said is exactly what I told her. Perhaps you need to go into a new profession? Hmmm. Seems like you and Bridgette are on the same page, Cedrique (maybe you’re more of a style expert than you thought…). Yes, I want to upgrade my skirt wardrobe, so that’s in my plans for the coming year. I can see that the flared skirts add to that churchy vibe and my attempts to dress them down have edged me from church into frump (I think I’d rather have the church vibe!). I think I may have to have a little ceremony when I pass the jacket on, as it’s gotten so much attention. I still have it only because I usually wait until I have a bag full of items to take for donation. I had tried to re-consign the jacket, but they didn’t want it back! I’m sure someone will end up loving and wearing it, but it isn’t going to be me. So glad you are going to follow your instincts and let the blue jacket go. Your other outfits look so much better and you really don’t need to wear items you don’t feel right or look good in. It’s interesting to compare it with your other jackets to see why they work and it doesn’t. I think it’s that it needs to button lower, and the sleeves need to be mid elbow to wrist not elbow length. I love your coral jacket and think it would great with the skirt and black sandals. Great necklace choices, they really give your outfits style. I think your observations about why the blue jacket doesn’t work are right on, Lynn. I have worn the coral jacket with many of my skirts and really like it. I also have a bunch of other jackets that I love, so you’re right about my not needing to force myself to wear things I don’t feel (or look) that good. Thanks for your compliment about the necklaces. I have quite a few nice necklaces but wasn’t wearing them all that often. So I’m challenging myself to wear them more often and am usually happy with the resulting looks. So many pretty outfits! I love all of the pants ones on the bottom. Your new sandals and jackets give such a new look to things you already had. It’s such a good visual example that we don’t need to buy as many new things as we think to update our wardrobe. All of your new outfits seem more streamlined and flow better to me. I think that was key to create the edgy rather than conservative look that you were going for. Great job! You are so right, Tonya, about not needing to buy a lot of new things. How did I get it so wrong for all of these years? Oh well, at least I get it now and can do better moving forward. Thanks for your kind words about my outfits. I like them a lot better and feel more like myself in the new looks. I am not a very conservative and stodgy person, so why look that way? I look forward to your blog posts and find myself checking for new posts! I was very happy to see today’s. You can tell, even in the pictures, that you feel better in your improved outfits. You seem much happier and at peace, perhaps it’s feeling comfortable in your clothes?I LOVED one of the first outfits you modified (the blue cropped jacket with white tank and jeans). You have an amazing body! This really hones in on that. I think this is the ideal shape for a woman – petite on top, curvy on the bottom, don’t be so hard on yourself! However, I think that if you DON’T like something, it’s great that you stick to your gut! I wouldn’t want to wear something because “it looks great” if I don’t FEEL great in it. I also really liked one of the last outfits with the blue cardigan. I think the blues/periwinkle colors look great on you! You are quite insightful, Millie. I do feel happier and more at peace in the restyled outfits. Clothes really do make a big difference in how we feel, and we don’t need to have a jam-packed closet in order to feel good in what we’re wearing. Thanks for your kind words about my figure. I know that I need to better appreciate what I have instead of wishing for things that will never be (like narrow hips and thighs). I can see the beauty in other women’s bodies, so why not my own? I really like the blues on me, too. I have added a few cobalt blue items to my wardrobe over the past year or so and I really love wearing them. Good point, Kate. I doubt I would go towards too much edginess, but I have seen others do that. A little can go a long way in the edge department, so I’m staying mindful of that. But I’m glad to have toned down the sweetness, as it’s really not a fit for me anymore (not that I’m not a nice person – LOL). I love Imogen’s blog and have enjoyed her posts on color and contrast. I see some women who dress like virtual rainbows and pull it off, but I prefer to keep it simple like you mentioned. As everyone has already said, you’re really looking fabulous! You hit the nail on the head with your comment about only needing a few strategic pieces. The caged sandals are a perfect example. I’m so glad you gained so much from your sessions with Bridgette. Yes, I really did gain a lot from my sessions with Bridgette, Kayla, but I was also willing to do the work. I think I was really just ready for a change as I edge closer to the big 5-0. It’s funny because I made some big changes to my look at I got closer to 40, too, but then I really lost my way with all of the overshopping. Buying less and having a smaller wardrobe (albeit still not really small) have helped a lot with clarifying my style and making it easier to get dressed each day. This might not make sense but maybe Bridgette can explain further – tops and bottoms look better when they’re not 50:50. A longer jacket and shorter skirt or a shorter jacket and trousers break up the line and look less blocky somehow. Maybe that’s why you love the shorter toppers with trousers! You’reconfidence is shining through this post Debbie, I’m so pleased for you! Actually, Bridgette did talk about those principles in our sessions and I briefly touched some of it in this post (towards the end): https://recoveringshopaholic.com/styling-advice-from-bridgette-raes-casual-skirt-outfits/ It’s interesting how I can actually look short if I wear the wrong proportions (because I’m almost 6 feet tall!). I have hesitated to wear shorter jackets with pants because I’m self-conscious of my backside, as it were, but I am wearing a longer top with the jackets in the photos in this post and it still works. Baby steps… I know my bottom isn’t as large as I think it is (I even sent Bridgette back views of some of my outfits and she confirmed that), but sometimes reason doesn’t overpower emotions. But if I keep nudging myself out of my comfort zone, I will make progress (just as small steps with my shopping problem have added up to a lot of change over time). Thanks for taking the time to answer Saltbox’s question, Bridgette, and for posting that artilce link. I hadn’t seen that one before, but it’s very helpful! It’s an oldie but goodie and I may have to share it in my next links round-up, as I’m guessing that very few of my readers have seen it. Very interesting! I’ve been following Imogen’s blog for a long time, but not as far back as 2009, so this is the first time I’m seeing this post. I wish there were more photos to illustrate the point. I wonder if she has covered the topic again later. I must throw my hat in the ring one more time about the overly discussed blue jacket. Its not that its too frumpy, as Dottie suggests. I think the main problem is that it looks shrunken! No matter how you style it, you look like you are about to burst out of it! I think this style of jacket is meant for someone more petite than you. Last year I had a sweater in a similar style and color. I was always fussing with it and felt that I appeared “overdone”. I finally realized the sweater was designed to enhance a petite woman whose smaller proportions would be flattered by the volume provided by frills and assymetric lines like this. And like you, I was loathe to give it up because the blue was flattering to my eye color. But style won over color, and I found a long slender simple cardigan in the identical color that is much less fussy and has a very streamlined look instead of looking so forced. You are right about the jacket, Deby. I don’t know why I thought it fit me. Maybe I can blame it on the mirrors in the fitting room 🙂 I hope a more petite woman will be able to enjoy the jacket and I will hold out for something that fits me better. Thanks for sharing your sweater story, as it helps me to feel less foolish for my jacket faux pas. I hope that I am as fortunate as you in finding a better option in my favorite color. Is that a Carved Creations necklace you’re wearing in one of the top pics? I have one and love it but I need a longer ribbon. Do you mean the long silver “donut” on the black cord? I bought that at J. Jill last year. I hadn’t heard of Carved Creations before, but I just checked it out. Perhaps I will buy a gift for my mom from that site. I hope you find the longer ribbon you need. I have always believed in the power of an “edgy” shoe to transform an outfit. Very true, Carolyn! I am really learning the power of shoes this year. I often try on a number of shoes with my outfits and I can see a big difference in the overall look based upon which shoes I wear. I have 1 comment: You look great in pants! I know they are not your favorite article of clothing to wear, but you really do look good in pants, better than in skirts, in my opinion, at least! Thanks, Sherri. I actually like to wear pants, when I can find ones that fit me well. Fortunately, my hard work in searching for pants has paid off this year. I now have quite a few better options than I had back in 2013 and it makes a big difference. Wow! Thank you so much for this post! It’s actually blowing my mind a bit how such small and simple changes can really rescue outfits. Very instructive. Thanks, Sarah. I’m glad you liked the post. Yes, it blows my mind, too, how small changes can make a really big difference. A whole new world has opened up for me! I know I am late too the party, but wanted to comment. I have not read in detail, but that last set of photos is quite revealing. You look stunning in those tailored classic lines without many adornments or fussy embellishments. Simple and chic. Well done! Thanks, Cornelia. I see a lot of people are liking the pants looks. So my experimentation with the dreaded blue jacket paid off because it led to other looks that are a lot better. Yes, I’m definitely more into simple clothing styles now. I used to like the embellishments, but not so much anymore. I guess we all grow and change! I’d like to say, I really admire you and what you are doing with your blog. You are very brave to open your wardrobe and your life to your readers, and I appreciate your honesty and courage. I shop emotionally at times too, and it’s great to see the steps you’re taking to curb your spending and improve your style. I was introduced to your blog through Bridgette Raes’ article about the infamous blue jacket so it was great to see the final results – I like the last three, but if you don’t love the jacket you are so right to get it out of your life. Life’s too short to wear clothes that don’t sing to you! After reading (and enjoying) quite a few of your blog posts I’d like to make an observation; please forgive me if I say anything out of place! I see what you mean when you talk about a “churchy” vibe, but I think this post shows that you have clearly departed from it. I don’t think “churchy” is the same as formal looking, though – I think you look best when your outfit is at least smart casual. It’s interesting that you are trying to look less formal, more casual – is it because you feel out of place when you are working or with friends? It may be that your style just inherently requires a little more structure (which usually equals a little more formality). Have you considered the “raw materials” you are working with – your figure, face, and colouring? And, most important of all, your style preferences; the things that appeal to you. You are a tall, beautiful – let me say that again because it’s important – beautiful woman, with strong, high-contrast colouring (I agree that you look like a winter), and quite striking features. Casual, unstructured outfits in subtler colours simply may not suit you. On the other hand, getting it RIGHT is going to make you stand out – whether you like it or not – because you are strikingly beautiful (and tall, and slim) and the right clothes only magnify that. Is there a possibility that you are aiming for casual simply because you feel uncomfortable standing out, even for the right reasons? I think Imogen Lamport’s blogs on Yin and Yang may be relevant here. The outfits which look best are quite yang, with only small touches of yin. Clean lines, and symmetry, rather than ruffles flounces look best, with small touches of detail. This may be why the asymmetrical and fuller hem skirts don’t quite work. Welcome, Alice, and thanks for your comment and kind words about my blog and my appearance. In answer to your question, I’ve been trying to dress more casually in order to better fit in where I live and for my life. I live in San Diego, which just may be the casual capital of the U.S. Plus, my life is very casual. However, I DO feel more comfortable and happy when dressed in a more “smart casual” manner, so I may have to make peace with being more dressed up than most people around me. When I dress down too much, I don’t feel like myself and I don’t feel very attractive. I think that I don’t want to stand out too much because I’m naturally quite introverted, plus I know that I already stand out because of my height. Perhaps it’s just a matter of being more comfortable with who I am, which is something I’ve really been working on. I am not from San Diego and where I’m from (SF Bay Area), people dress up more. I’m more comfortable there, but this is where I live now (and have for over 12 years!). So I’ve been trying to reach a happy medium, but what I’ve learned is that I will always dress up more than most people here and that’s just going to have to be okay! Lynn, I will have re-visit Imogen’s posts on yin and yang. I remember reading them and being fascinated by the concept. I am fine with letting go of the fuller skirts and am moving in that direction, but I LOVE asymmetry and want to find ways to make that work with my style. I’m sure Imogen will have some answers on how to incorporate SOME yin when one is mostly yang. Final thoughts on the blue jacket: I mentioned several posts ago that I thought this jacket looked like it shrunk on you. It’s hard to tell from the photos, but the sleeves look about an inch or so shorter than the sleeves of the lovely b&w cardigan, which is a much better length on you. Also, the one-button look of the cardigan created a wide gap below the button which is less flattering — is creates a wide expanse of fabric (less noticeable in the all-black outfits). When combined with the wide neckline and ruffle, the overall effect looks like the jacket is too small. The single-button black jacket has strong vertical lines and doesn’t create the same “shrunken” look at all. The bold electric color “fights” the soft ruffled style. I try not to be seduced by brand names; even top designers get things wrong. Beautifully put, Dottie. That is exactly what I thought of the blue jacket, but you worded it so much better. I didn’t see your earlier post about it seeming shrunken in appearance or else I wouldn’t have been redundant earlier in this thread! One more observation, I think it goes beyond the cachet of a designer’s name. I think we are very often drawn to styles that we wish we could wear (yet secretly know we can’t), because there is a part of us that wants to play ‘dress up’ and express a different side of our personality. That’s what I think when I look at the blue jacket (and my own blue sweater)–I wanted to look like the kind of woman (romantic, spontaneous, quirky), who would really look good in that style. But given my own raw material does not lend itself to frills and odd buttoning arrangements–I looked, not like the romantic heroine I imagined in my mind’s eye–but just plain OFF. Dottie and Deby, your observations are very astute. The sleeves are definitely too short on the jacket and that’s a big reason why I’m letting it go (as well as the ruffles, twee style, etc.). The point about the button and the large expanse of fabric underneath the jacket is why I didn’t like the look with the white top. It just looked like too much white to me (it was less noticeable with the black looks because my skirt and pants were also black). Interesting point about wanting to be the type of woman that a garment evokes. I don’t think that was the case for me with the blue jacket, as I don’t really want to be a romantic style, but I think it’s definitely been true for me with other things I’ve bought. But we always have to consider our “raw material” like Deby said. I don’t think my raw material lends itself to frills, either. I’ll be happy to get the jacket out of my house. I usually wait until I have a whole bag ready to consign or donate, but I may make an exception in this case! Debbie! Let me be the 100th(ish) to say that your last three pants outfits there are really awesome! I’d say they are “Debbie enough” for sure! But I hope you also know that in addition to all the physical compliments being doled out in this thread, I also think you are beautiful on the inside! Being able to share this all with everyone and create a safe space here is so invaluable, and I hope you know how much we all appreciate it! I’ve been MIA from commenting for a while, finishing up my semester-from-hell, and now that it’s done I have to also assess the damages. The high stress levels seem to have worsened my shopping a bit. I’m only a little over budget for the year but the real problem is the agonizing over every item, trying to decide if it’s perfect enough for my capsule and obsessing over when I should buy! The sales this time of year are too hard to “time” and I’m finding it causes me a lot of stress. I recently missed out on a pair of booties that I really wanted because I got a defective pair (jammed zipper) and there were none left in my size after I returned them. I think this awakened my FOMO and it’s so hard to get it back under control even though I know I do have a legitimate wardrobe need to fill. Now I find myself worrying over other items which have gone on sale– will they sell out before I decide? I spent so much time searching for the “perfect one” that now I feel like all that time will be wasted if I do not purchase. But I want to be smart with my money. Ugh, holiday anxiety. I did manage to bring home a few higher-quality items that I know (or at least hope) will serve me for many years. I’m being more diligent in hand washing and caring for everything as well, and I can attribute that to your blog and some lovely guest posts as well! One highlight was a Magaschoni cashmere cardigan which seems like a much nicer grade of cashmere than some of the other “everyday” cashmere that I have. I do recommend it, as it’s very soft and not itchy at all (like wool can be for some people). I have been hesitating somewhat to buy new expensive things because I’ve been losing some weight lately (finally!) and don’t want to have to get rid of things that no longer fit in a few months. So I guess I’ll be hitting up the thrift stores for pants in the meantime – another dangerous area for me. On a brighter note, like others, I also noticed how your response to constructive criticism has been so much more self-assured. 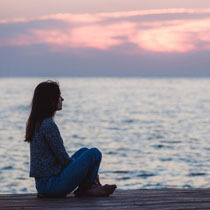 You are definitely letting things roll off your back more, and I think that might have something to do with the work you’ve been doing on really nailing down your self-perception and identity lately. I think the session with Bridgette maybe has helped you see yourself a little more clearly and be OK with choosing the things you really love and are drawn to. I think we have a similar aesthetic at times – I also have red hair and like wearing black, moto jackets, and strappy leather sandals (even though it’s too cold here 😦 ) and really enjoy seeing you experiment with them. Maybe someday you will treat us to a fully styled version of your new look? Thank you for your kind words, Sarah. Congrats on getting through a difficult semester! I’m glad you’re back to commenting again, as it’s always good to hear from you. I can definitely understand how you would struggle with overshopping when under so much stress. It sounds like you have made some improvements with your shopping even though you have also struggled. The cashmere cardigan seems like it’s very nice and will serve you well. As for me, I am feeling more self-assured in many ways. I’m sure I will do more style posts and share photos again, especially as things continue to come together and fall into place. Working with Bridgette helped me a lot! I never comment your posts but read them regularly. This one was excellent! I hope you’ll continue experimenting and share your before/after pictures with us. Just wanted to say that the work you are doing with Bridgette is really paying off – fantastic results! Now there is some edge to your outfits! Really loving the three last pics. I think you are onto something, and loving it that you are creating outfits with existing pieces from your wardrobe, keeping some, letting go of others. Good luck with everything! I think when you find a style that feels like a second skin – I think you are getting closer and closer – you will spend a few pleasurable minutes picking an outfit in the morning and then focus on something else for the rest of the day. The outfit is a source of quiet pleasure all day lo g but no longer the focal point. You are the focal point. Good to see you commenting here, FrugalFashionista. I appreciate your kind words about my outfits and my style journey. I have had more of the type of days you mentioned where I put my outfit together and then focus on other things. It’s not every day yet, but it’s starting to come together. It feels good, too! I think that 2015 will be the year when all of my hard work on my wardrobe, shopping, and style will truly pay off. But I’m trying to enjoy the journey as much as I can along the way.